I found this photo (along with another) here, where we're told that it was taken on January 19th in Hanam City near the Paldang Bridge. 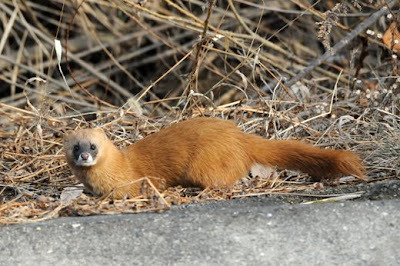 The animal is a jokjebi, or weasel. I've seen weasel-like animals in fields near Gimpo Airport and in Magok-dong, but I'm not sure if this is the same animal, as both times they appeared only briefly at dusk. It's always nice to run into mammals in Seoul, as they're not so easy to see here (despite the wild boar 'invasion' three years ago). To the west of Seoul, along the Han River, barbed wire put in place by the military decades ago has created a nature reserve, where even elk can be found. 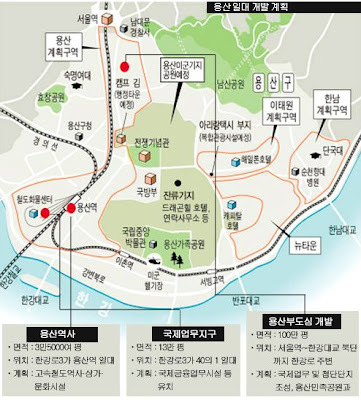 As this Donga Ilbo article reveals, however, this area will soon see the barbed wire removed, so the fate of this accidental preserve is up in the air at the moment. "Weaseling out of stuff is what separates humans from the animals. Except the weasel." Five protesters and a member of a police SWAT team died and 24 others were hospitalized following a violent standoff at a construction site in central Seoul early yesterday. 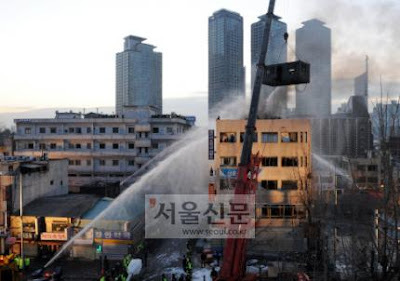 According to police, protesters took over a five-story structure near the Kukje building and Yongsan train station at 5:30 a.m. Monday, in opposition to ongoing redevelopment of the area. Some squatters demanded higher compensation for their houses and stores, which are to be demolished for a massive development project by the nation’s construction giants - Samsung C&T Corporation, Daelim and Posco. Police said the demonstrators built a watchtower on the rooftop and armed themselves with Molotov cocktails, bottles of acid, bricks and slingshots. Police issued an ultimatum to the protesters to move out by Monday night or be forcibly removed. 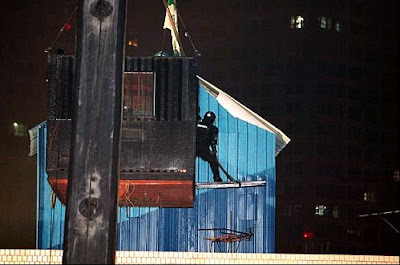 Around 6:45 a.m. yesterday, a crane lifted a container box carrying the SWAT teams [the Korea Times notes that it carried 50 men]. “When the SWAT teams tried to enter the watchtower around 7:26 a.m., the demonstrators sprayed paint thinner and threw Molotov cocktails,” Baek Dong-san, chief of Yongsan Police who commanded the operation, said during a press briefing. 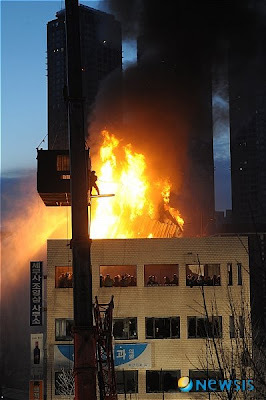 “The watchtower caught fire and police withdrew. We managed to put out the fire by 8 a.m. and found five bodies, including one police officer.” A further search yielded one more body. Yongsan police said that of the 24 others who were injured during the stand-off, 18 were police officers. Kim Nam-hun, a 30-year-old SWAT team member of the Seoul Metropolitan Police Agency, was killed during the operation, police said. The other bodies were not identified, but the National Institute of Scientific Investigation said fingerprints should allow identification by tomorrow. [...] The police operation resulted in arrest of 25 squatters, and the prosecution is investigating if the National Alliance of Squatters systemically planned the violent demonstration. Of those arrested, only seven actually live or own stores in the area and are eligible for compensation. The rest were members of the group. It goes on to explain that the squatters group were planning to hold a candlelight vigil at Yongsan Station, and called for an apology from the president. The police painted the demonstrators as unduly violent and said they had no choice but to intervene. More photos of the confrontation and fire can be found here, while a Korea Times article is here. 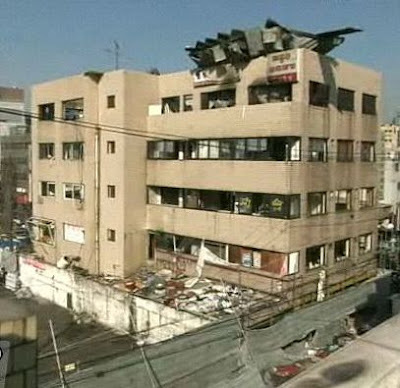 Here's a photo of the building from behind, showing the remains of the watchtower on top. 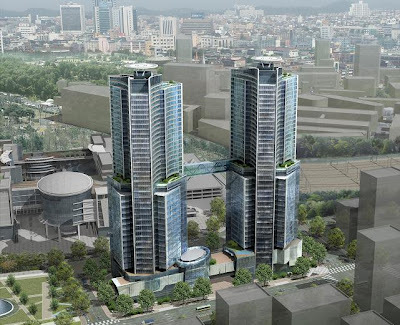 According to the Yongsan District Office, the construction site used to be occupied by 434 stores and 456 households. About 80 percent have received compensation and moved out. Plans call for the construction of three skyscrapers for residential and commercial use. This is just one of the planned redevelopments in the area, as the map below reveals. More such photos are pointed out at this blog (and this map shows that plans are afoot to redevelop the areas to the west of the redevelopments laid out below). As you might notice, much of the district is set to be redeveloped at some point in the next 10 (or 20) years. 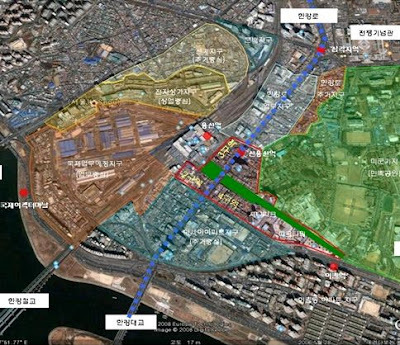 When you take into consideration the new town plans (developed under Lee Myung-bak when he was mayor of Seoul), which will redevelop 24 square kilometers of Seoul (or 4.5% of its total land area) as well as this plan to raze Yongsan-gu to the ground, at some point it might seem a little excessive, especially seeing as many of the owners are not able to afford places in the new apartments due to such little compensation. I'd have to say I'm in total agreement with Tom Coyner's comment here, and would add that while you can't agree with the violence the squatters used, little is said about the violence the construction companies use regularly to intimidate and force people to leave their homes. If you look at the rest of Jon Dunbar's photos of the Yongsan area to be redeveloped, you'll see the disturbing graffiti and the smashed storefronts left behind by the gangsters hired by the construction companies. This is no secret, and has been going on for decades - it was documented in Kim Dong-won's "Sanggye-dong Olympic" and has been shown in feature films like Holiday, for example. That people might choose to match violence with violence isn't surprising - it's not for nothing that Cho Se-hui's celebrated book The Dwarf opens with the murder of a developer (in the story "Mobius strip"). If the government is going to give construction companies free reign to raze vast sections of Seoul without paying fair compensation or listening to the voices of people living in these neighborhoods, it shouldn't be surprised when groups who learned to use violence under the thugocracy of Park Chung-hee and Chun Doo-hwan find desperate people to populate their ranks and lead to tragedies like yesterday. I was looking up old maps of Pusan and upon looking at the University of Texas Perry-Castañeda Library Map Collection I found that their Korea collection had a new addition: Korea City Plans - U.S. Army Map Service, 1944-1946. The map images in this collection include Seoul (which, along with Pyongyang, was already at that site) and a handful of ports now in South Korea (the Japanese names are in brackets): Kyongsong or Seoul (Keijo), Chinhae (Chinkai), Kunsan (Gunzan), Masan,Mokp'o (Moppo), Pusan (Fusan), and Yosu (Reisui). The bulk of the maps are actually of present-day North Korean cities, including those near Pyongyang (Heijo) - Chinnamp'o (present-day Nampo), Kyomip'o (Kenjiho) (Present-day Songrim), and Haeju (Kaishu) - as well as those on the east coast (in order from south to north): Wonsan (Genzan), Hamhung (Kanko), Hungnam (Konan), Najin (Rashin), Ch'ongjin (Seishin), and Unggi (Yuki) (Present-day Sonbong). For other photos of some of the cities mapped above, go here for a folder (in a zip file) of colonial-era photos commenter Mika pointed out to me over a year ago (the download 'button' is at bottom left, you have to wait 20-some seconds). There are photos of colonial Seoul (Keijo), Incheon (Jinsen), Busan (Fuzan), Gunsan (Gunzan), Daegu (Taikyu), Daejeon (Taiden), Pyongyang (Heijo), Sinuiju (Singisyu), Cheongjin (Seisin), Wonsan (Genzan), Hamheung (Kanko), and Nanan (Ranan). In all, there are about 330 photos in the 80mb zip file.